Closest matchup: In a region full of tight match ups, Secret of Mana snuck through by the slimmest of margins, advancing against The World Ends With You by a single vote. Biggest Blowout: Only a single Negative Worlder was brave and intelligent enough to vote against the vastly overrated Resident Evil 4. Biggest Upset The beloved indie title Cave Story, available on several recent systems, took down the higher ranked Harvest Moon 64, available solely on its original platform. Pick up MH4U and let the healing begin. This round went pretty well. I was pulling for TWEWY, at least it lost a close one. 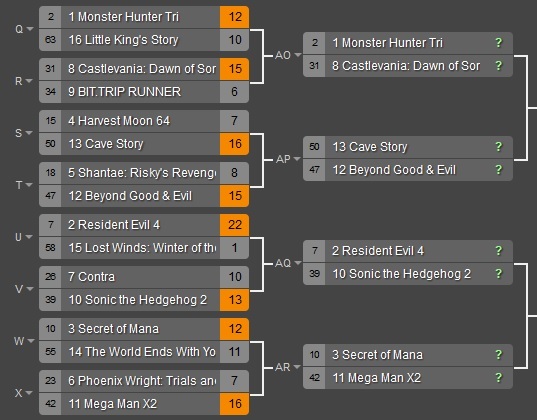 Happy to see Castlevania, Cave Story and Mega Man X2 move on to the next round. Resident Evil 4 was a given. I'm a little bummed about The World Ends With You, but the fact that it didn't move on only lends itself more to the "hidden gem" description it has earned for itself. Hey 6 out of 8 of my choices made it, interesting. Though it kind of stings (but isn't surprising) that Little King's Story isn't one of them. Monster Hunter barely squeaked through? Egad..